Gurley Thanksgiving candles are highly collectible items. These intricate candles were handcrafted using a variety of techniques, featuring whimsical designs to represent holiday icons for Thanksgiving. Franklin Gurley was the founder of the Gurley Candle Company, originally called W&F Manufacturing, which opened in 1927. For many years they focused on confections, including a variety of candies and chocolates. Several lines of these treats were created with edible paraffin, a by-product of oil refining. One of the most popular was a wax tube filled with a sugary colored liquid, called Nickel Nips. In 1939, Gurley started making novelty candles with paraffin wax under the Gurley Candle Company. Some of the candles were also sold under the name Tavern Novelty Candles. These candles were exquisitely detailed and tailored for a number of holidays, including Halloween, Christmas, Easter, and Thanksgiving. Each candle was made by hand, using a number of different molds to create just one item. Even though the candles were hand-made and carefully crafted, they sold for anywhere from 10 cents to a dollar at the time. Most people found the candles too pretty to burn, and therefore saved them to display. When the Gurley company closed in the 1980s, the candles immediately became sought-after collectors items. Of course, this drove the price up. Today, people are willing to pay much more than the original prices for vintage Gurley candles. 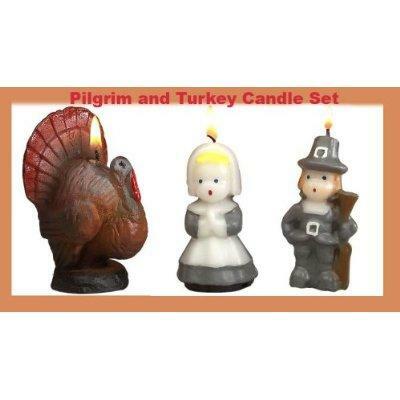 Turkeys - This is an example of the Gurley Thanksgiving candles that are shaped like turkeys in different sizes. The colors are still vibrant, and the attention to detail is apparent. Many other turkey designs were created as well. Mayflower - The Mayflower candles were actually solid wax candle holders in the shape of the famous ship, which held green taper candles. The tapers were affixed to the holders to avoid separation. Other Thanksgiving designs include a Thanksgiving church, colorful wax pine cones with twisted candles on top, and small candles in various colors adorned with wax leaves and acorns. Since the closure of the original Gurley factory in the 80s, there have been a few attempts to revive the classic candles. One line of these reproductions is sold through the Vermont Country Store, though they can't use the Gurley name to market them. The actual Gurley trademark has been purchased and several people have claimed to be bringing the company back, but so far this hasn't happened. Buying antiques and collectibles like Gurley candles online can be tricky, since you can't actually see the product before purchase. Make sure that the seller sends you a photo of the bottom of the candle, which should include a sticker with either the Gurley or Tavern name on it. The Tavern and Gurley candle companies sold millions of Thanksgiving themed candles over the years. These little pieces of art have become traditional decorations for many families. Next time you see a pretty holiday candle in the shape of a Thanksgiving icon, check the bottom for the Gurley sticker.